You are here: Home / LSAT Prep / What is the Best Way to Review LSAT Practice Tests? What is the Best Way to Review LSAT Practice Tests? 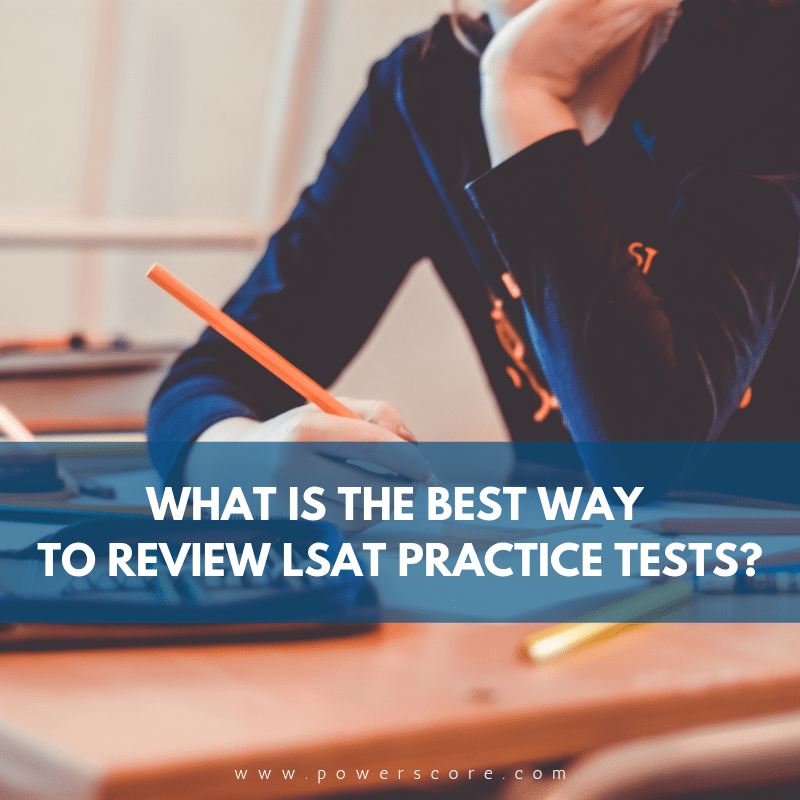 On the PowerScore LSAT Discussion Forum, there have been discussions about how to best review practice LSATs and homework problems. Students often make a critical error when studying. I want to address that and lay down a framework for optimally reviewing the problems you complete. This will help you get the most out of the time that you spend studying. What is the Critical Study Error Many Students are Making? Most students review the questions they missed and not the ones they answered correctly. This is the most natural error in the world, but you must review every single question you complete in order to get maximum value from the time you spend studying. As I have discussed, you can’t get all of the information contained in a question by looking at it once. Although you may have answered a question correctly, you may not have fully understood the question. And, equally important, there may have been a way to do the question more quickly or more decisively. In other words, just because you answered a question correctly does not mean that you answered it optimally. Nor does it guarantee that you can repeat your performance the next time you encounter the same concept. Last, as Jon Denning has said, great test takers treat success in much the same way they treat failure. Further insight into victory is as likely to facilitate continued victory as an understanding of mistakes is to promote future avoidance. As you review your practice tests and homework, look over questions you missed, but also assess questions you answered correctly. If the question was perfectly clear to you, check it quickly and move on. However, if you had any hesitation at all in choosing the answer, make sure to go over the problem in the same manner as if you had missed it. Ok, with that critical piece of strategy covered, let’s outline a consistent approach to reviewing questions. In the past, we’ve talked a lot about how to take practice LSAT tests, so I’m not covering that here. Instead, I’m going to specifically talk about how to review any test or homework problems you complete. There are three ways you can approach reviewing questions. Why discuss three different ways? Because using a single way can become tiresome and feel unrewarding, so it’s useful to mix it up on occasion. In general, the first method is best when you first are studying or feel “stuck.” The second and third methods are better towards the middle or end of your preparation. All methods could benefit from a tracking mechanism. We offer tracker sheets in our free LSAT Self-Study Plans. Feel free to use those as-is or use them as a model for ones you create. Note that the final 7 steps will be identical in all method and are presented at the end. Let’s look at each. This method delays your consideration of the answers until after you’ve had a chance to carefully examine each problem. Perfect for if you’re trying to determine whether you really understand each problem or if you were getting lucky. It’s especially useful if you are struggling at a score plateau or find your scores bouncing all around. After you complete the test or question set, do NOT check the answers. Instead, write down every question that you felt you struggled on at all or felt less than certain about. If you couldn’t finish certain questions, add those to the list with a notation that they were unfinished. Next, go back and review every question un-timed, including the ones you did not answer. Your goal is to understand each question as well as possible, so take your time. With every question now reviewed in detail, you can now check all your answers against the answer key. You should produce two separate scores. One score for your original timed performance and another score based on the answers you changed during your blind review. Your second score should be better! The ones you didn’t mark as a problem. These can be your best friend or very dangerous. If you didn’t mark a problem as difficult and answered it correctly, then no problem. But if you missed it then this question tricked you. Stop and analyze it closely, and make a special note on your tracker about the question (later you’ll review all these super tricky problems together in order to find any deep patterns you might be missing). The ones you marked as a problem but kept your answer the same. If you mark a question as difficult but kept the same answer both times and it turns out to be the correct answer, then no problem. But if you missed it, then you’ve come across an idea or formation that you need to learn more about. Stop and review the problem, seeking outside explanations if needed. The ones you marked as a problem but changed your answer. If you changed your answer away from a right answer but to a wrong one, first determine why you changed your answer. What drew you from your good choice to a bad one? Then, make sure to mark these problems as well, because your grasp of the main concept or wording in the problem needs work. Stop and review the question until it is clear. If you changed your answer from a wrong one to a right one, then good! You saw a difference from the first pass to the second, which shows improvement. Make a note of what happened, and re-examine the problem so that next time you see the right answer the first time. And finally, if you were wrong with both answers (! ), then review the problem thoroughly before placing it in the super tricky category from above. After you complete the test or quetion set, immediately check the answers. Write down every question that you missed or that you answered correctly but found to be a challenge, but do NOT write down the correct answer. Next, after taking a break of anywhere from a few hours to a few days, go back and review every question, including the ones you answered correctly. Your goal is to understand the question as well as possible, and to re-answer each question that you missed or felt was challenging. If there is any obvious deficiency that’s causing you to miss questions in the set you just completed, go study that topic immediately. For example, let’s say that you noticed that you kept mis-diagramming conditional rules in Logic Games. If that’s apparent to you, go study that topic right then. The idea is that if you see that something is causing your problems, don’t delay in attempting to address it. After you complete the test or question set, immediately check the answers. Write down every question that you missed or that you answered correctly but found to be a challenge. Next, go back and review every question, including the ones you answered correctly. Your goal is to understand the question as well as possible. If there is any obvious deficiency that’s causing you to miss questions in the set you just completed, go study that topic immediately. The idea is that if you see that something is causing your problems, don’t delay in attempting to address it. Wait a few days, then redo the questions you missed or gave you trouble. Take a few days off from studying that particular test or set of problems. After another three days (preferably longer), return to the question set and review any question that was confusing. If you still can’t answer the problem correctly or figure out what you did wrong, consult an answer source. If you’ve given yourself at least two strong looks at the question and still do not understand it fully, consult an external answer resource. That might mean asking your PowerScore LSAT course instructor or tutor, looking at one of our publications, or posting question on our LSAT Forum. Every 10 to 14 days, review your tracker and note the areas where you are having problems. Then restudy the concepts in your course books, in the Bibles, or with your tutor. When you run into difficulty, don’t panic and don’t place undue weight on isolated results. Your performance will naturally vary, especially as you complete more and more problems and tests. These variances are natural (see my article on The Casino Effect), and you must understand that subtle variations in your performance are natural. If you do have a legitimately bad result (such as an unusually low practice test score), don’t look at that as the end of the world. Failure, while not desirable, can provide you with certain benefits. So, if you do suffer a legitimate reversal of fortune (and not just the random kind mentioned in #9), then make sure you get every possible benefit from that failure. Pick One and Give it a Go! I covered the main ways to review questions because some people prefer one approach over the other. When you are just starting out, experiment with all three and see which one you prefer. If you like to mix things up, use different strategies depending on how you feel about the test or problem set you just completed. Sometimes you absolutely have to know why a problem is wrong, and sometimes you can wait. I began my studying about the start of the summer. My diagnostic was 140 i am now PT around the low 150s. I want to get a 165 come December, is this reasonable? What would you suggest i do to achieve my goal seeing that i will also be in school this semester, although not my most hectic semester. I have done about 10 timed tests and maybe 6 untimed tests (which i score in the high 160s). Albeit i admit my reviews have not been thorough and certainly not of my correct answers. I am just wondering what you would suggest? How many days a week? Would appreciate a response, thanks alot! You only just posted this (about 10 minutes ago, I think), but I’m actually already working on a response to you! It just takes more than a few minutes for us to craft a quality reply, but we always reply to questions and comment on our blog and forum. So, you’ll get a reply pretty quickly on this one (probably within 30 minutes from the time it was posted, which is really I fast I think), but at other times it may take longer (such as a day). So, please keep an eye out here and you’ll see a reply from me shortly. Thanks! Thanks for the question! First off, congrats on the score increase so far—it’s always nice to see steady progress, especially when you know there are things that you could do that would make your studying even better (such as more thorough reviews and reviewing correct answers). Is a score in the 160s possible? Certainly. You still have plenty of time until December, and it appears that you know some steps you can take to do even a better job studying. However, for me to determine how realistic such an increase is, I need a lot more information. I wrote an article that explains the type of info we need, and that article is at http://blog.powerscore.com/lsat/need-lsat-advice-how-to-help-us-help-you . If you could read through that and then supply information on as many of the pieces of info requested as possible, that would give me a far better base from which to make an analysis of your chances. You can post that answer here, or on that article—whatever you prefer is fine. Second, you might find it interesting to read my lengthy exchange with a student of ours on our LSAT Discussion Forum: https://forum.powerscore.com/lsat/viewtopic.php?f=2&t=4666 . He was attempting to go from the 140s into the 170s, and we talked about a wide range of topics that related to his pursuit, and many of those relate to your quest as well. He ultimately increased his score by 24 points, so I think you’ll find it an interesting read. Once you post back more details about your performance and studying up to this point, I’ll post another reply to you. But, just as an fyi, I probably won’t be within 30 minutes of when you post—I have several meetings coming up that will take a lot of time today 🙂 I’ll do my best to get back to you asap though. Thanks! Hi Dave, thanks for replying on the other post. I followed your link here and have provided the info below. Study History: Since May have been taken a free prep class through University’s Law faculty for “low income, high potential” candidates. Helped me improve my diagnostic from 140 to low 150s. I’ve done a total of 9 timed PT in the PT30-50 range and some random sections on the side (definetly no more than 20 PT have been touched in total). During the summer months totalled about an average of 20-30 hrs a week of independent studying. Scoring History: Diagnostic 140. Other scores have been, 150,143, 151, 148, 151, 151, 155, 151, 149. Section scores are as follows: LR 7-10 wrong, Games 2-4 wrong, RC 7-10 wrong rough averages. In terms of finishing, LR most of the time i dont get to finish the last 5 and i guess, Games im typically finishing unless there is a really tricky game or i make a stupid mistake, and then RC i always guess the entire last passage alot of the times im just skimming the actual text because time is running out. Highest LR 6 wrong, Games 2 wrong, RC 7 wrong. Problem Areas: LR is where i really want to improve as its 50% of the exam and im not really finishing it on time. Also my timing as im not completly most sections. In terms of questions on LR my weakest are probably Flawed Reasoning, Assumption, Must be True, and Weaken but i havent really been tracking my issues. Other info: my exam is in the morning and im a morning person so im usually in the library studying in the morning. Im back at school now 4th and final year. 10 hrs a week of class this semester in Pol Sci, so alot of reading. I really just need a set schedule or routine to follow on a weekly basis using the material i have right now. How many PT a week? Reviewing day of writing or the next day? can i split my day into lsat work in the first half of the day — lunch/break–school homework in the evening? Hi Arman, I’ve received your comments and the email you sent in to the office as well–thanks for those! With the LSAT happening this Saturday, we are just slammed at the moment trying to help students prepare for that test, and I have a queue of dozens and dozens of questions I’m attempting to answer. So, I will get to you questions as soon as I possibly can, but it likely won’t be for a day or two. I’ll do my best to make it even sooner, though. Thanks! Hi Dave, thanks so much! I guess I should add I’m scheduled to write this Saturday but I will be cancelling my score due to my situation. I think that’s the smartest move. 1. If you know that you are cancelling your score this weekend, don’t take the test. Better to delay it and not have it count as one of your three takes within a two year period. Cancellations count, postponements don’t! 2. Based on the very helpful info you posted, I wouldn’t focus on doing a lot of tests, and would maybe do about one per week on average for the time being. I say that because I would focus more on learning concepts and reviewing questions. Doing a large number of test without having the methods locked down will just lead you to repeat the same mistakes over and over. So, I would spend a lot of time reviewing concepts and techniques, then slowly start to take more and more tests. 3. For the test you do complete, use the Second method (Delayed Blind Review) on this page: http://blog.powerscore.com/lsat/the-best-way-to-review-lsat-practice-tests. do your review the day after or two days after, depending on your schedule. 4. You can definitely split your day up into halves, and I see now problem at all with doing the LSAT work in the AM and your school work in the PM. 5. You are right to focus on LR, not only because that is 50% of the test, but because your work in LR will help somewhat with RC too. 6. Right now, begin tracking your issues! Without data, you are flying blind and only guessing at what is giving you trouble. We need more data! that said, both Must Be True and Flaw/Method questions are critically important, and focusing on them will help you solve other question types as well. Ok, that should get you started, and consider the advice I gave in the first point above–burning an LSAT take isn’t ever advisable. Hi Dave, thanks so much! I’m thinking of taking a week off just to recover from any possible burnout effects i have. So as per your instructions i will begin with sections as oppose to full tests. I haven’t taken a practice test in a few weeks but I’ve been hitting around 148-150. My diagnostic was 142. However, I have been reviewing the Bibles and doing sections, and I’ve gone from missing 13 per LR section, to a last one of 7. My LG sections have received similar results, though these are untimed since I’m still trying to get down the mechanics. My question is if I can get a 163 by September 16th. I have exactly 7 weeks, and I’ve read that people have increased 20+ points in 6 weeks, such as a 149 to a 171, but I’m still unsure if it’s real to be honest. Are there any study tips you think may be helpful? I am understanding more and more of what I did wrong every time I go through the questions, usually getting the correct answer the 2nd time around without knowing what the correct answer is. Thanks for the message! I’m always stoked when I see students looking for a big increase, because having that desire is the first step towards making the journey. So, to answer your first question, are jumps of this magnitude possible? Yes, definitely. I’ve seen it lots of times and irrefutably it is something that has occurred and will occur again. Does it it occur for everyone? No, which leads us to the second part of your question. The second step is hard work, and it looks like you’ve started putting that in as well. They key now is to shore up any gaps in your knowledge and then to relentlessly practice with the ideas and review everything repeatedly. In other words, the LSAT has to be your best friend to have a chance of making this leap in short order. 1. Track of everything you do because you need to know where your weaknesses are. 2. Make sure you really know the concepts and techniques. For example, can you diagram LG rules without thinking, do you know all the standard inferences, or do you know all the ways to break down causality in LR, and so on. Instant execution with no delays is your goal. 3. You look at questions repeatedly until they are second nature. Review, review, review. Stumble on a question? Look at it again a few days later. Stumble again? Look at it one more time a week later. Get to know questions so well you could teach it to your friends without missing a beat, and without stumbling over any of the ideas (and if you can actually teach it to a friend, even better!). The above is work, I know, but it’s also the one proven way create large score increases. You have to make this test your friend and try to learn as much as possible about it. My name is Amy. I took the LSAT in September I plan to take it again in December. I started the Power Score LSAT course in July. I finished the course with a 160. By August I was at 163. I hit the wall in mid-august at 165. I want to push for a 170(+) for my December test. I used a lot of my practice tests during my September preparation. I’ve been taking some of the older practice tests, some of which I’ve seen before. Though there may be one or two questions I recognize, for the most part, there is nothing that seems obvious to me while I test. Are these test still good indicators of my performance? LG is my weakest area. I usually get -5/4. I struggle with grouping games, in particular, both timing and conceptually. Grouping takes me the longest and is where I am most prone to unforced errors. Advanced linear games are a struggle regarding time as well. The other games are not particularly difficult for me, but I would like to become better with my timing. I often push the 9min mark on most games. As of now usually, I only have 6 min left for my final game. I’d like to fix that. My LR’s have been -4/-6. Any tips for pre-phrasing? I find it challenging in certain questions or when I am in a crunch for time. The question types that I commit most errors on are the must are must be true & most strongly supported, justify, parallel & parallel flaws, assumptions, and MOR. When I get these questions wrong I find that the correct answer was one I had as a strong contender. How do you suggest I deliberate between two answers in these cases? Lastly my powerscore instructor was adamant that the we narrow down our first 10 questions to 10 min. I find that I push the limits of those 10min. Any tips for speeding up? The frustrating bit is that sometimes I’ll take 12 min on the first 10 questions and get -2 on those 10, and I will spend the same amount of time on the next 10 and get them all right. I realize the first 10 are the easy ones I just don’t understand why I have such a slow start there. Lastly, my RC is my strongest section. Usually, I have -3/-4. I would like to narrow those errors slightly, maybe to -1 or -2. I struggle with humanities. I’ve started to drill those RC’s more, and I’ve seen some improvement. I seem to commit errors on viewpoint questions semi-regularly. Any tips? How do you suggest I improve my speed here as well? I always find myself at a bit of a rush towards my final passage questions. I find that I make more errors here because the time adds a slight panic to my thought process.